HPS Intercooler Pipe Kit - Dezod Motorsports Inc - Home of the automotive performance enthusiast since 2002. 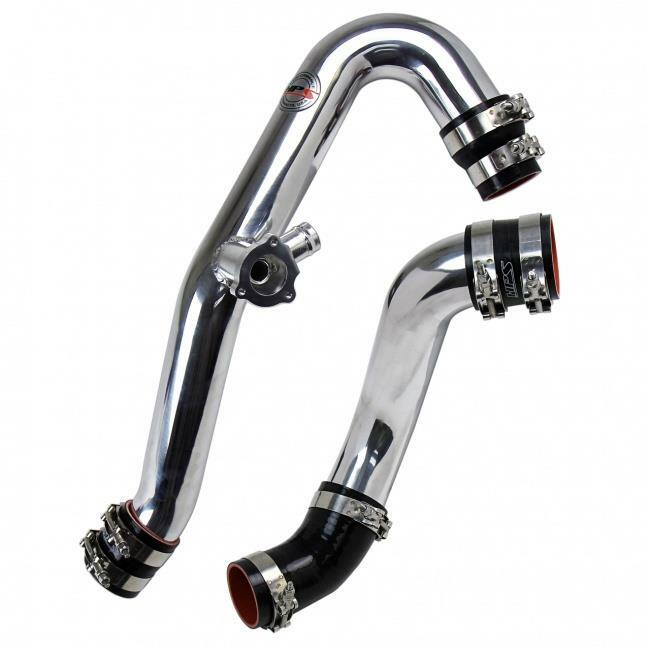 HPS Intercooler Pipe Kits are available as Hot Side only, Cold Side only or Complete Kit (Hot and Cold Side) and supplied with black high temp 4-ply reinforced silicone hoses is a direct replacement for OEM intercooler pipings and rubber hoses. Made from lightweight mandrel bent aluminum tubing, the charge pipe kit has less bend and better air flow compared to the OEM restrictive design. The bead rolled pipe ends prevent couplers from popping off under boost. The included HPS high temp 4-ply reinforced black silicone hoses with 100% stainless steel t-bolt clamps can withstand minimum 50+ psi of boost and replace the factory rubber couplers, which often crack or fail over a period of time. The intercooler piping kit optimize and smooth out the air flow, increase horsepower, torque and improve throttle response without re-tuning the ECU.